Here's the Gift from Coach Andy that was promised in the last newsletter. As a faithful subscriber to my list I'm going to give you a limited time offer to get the Kindle version of my book, How to Make All-Stars for free! (In an exchange for a review of the book). Don't worry if you don't have a Kindle, because now they have free apps for Windows and Mac computers and iPhones and Android phones. What a great day! MLB is officially starting and as such I'm running a 3 day promotion for my book, just click on the picture or go to Amazon to get it. But hurry, the promotion goes off on Tuesday and that's no fooling. If you go there on Wednesday if will be back up to the full retail price. If you you'd like the paperback version so you can mark it up and take good notes on your progress it's not free, but it is available for $1 off, but I'm not sure for how long. Please feel free to forward this email on to whoever you know that might benefit from striving to make all-stars as the free promotion is for anyone, you just have the benefit of hearing about it first. I haven't forgotten you and I have a gift for you as well. The book could help girls playing in fastpitch softball leagues where they pick all-star teams, but they might not identify with the pictures of the boys on the team. (I will be coming out with a girls fastpitch version in the summertime). And for men and women playing slo-pitch, I've included you. If you haven't downloaded it already, I recorded an audio that you can download to your phone, mp3 player, whatever, and listen while you're taking your swings so as to remind you of what you're trying to accomplish. Go here to get the audio where I coach you through 50 swings. You can connect we me on Twitter @CoachAndy. Just go to twitter.com and search on CoachAndy and you should find me pretty easily. 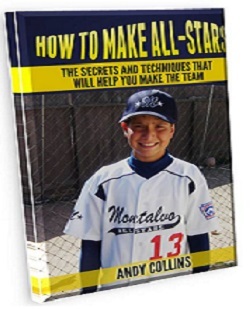 If you could tweet or RT "Free Kindle Book, How to Make All-Stars for Youth Baseball, howtomakeallstars.com #AllStarBook #OpeningDay #Baseball" that would help me out a lot and I'd appreciate it. Again, if you have any questions or comments you can call me at 805-642-5827 or write to me via e-mail.